Every year it’s the same. I plant more of almost everything than I need for the veg garden and give some of it away. Then the rest of it weakens or gets a terrible disease or is eaten by slugs or just keels over for no apparent reason – rather like sheep, incidentally, though sheep are less likely to be eaten by slugs – and I have to find replacements from elsewhere. This year, it’s the tomatoes: my first lot developed early blight. Astonishingly early blight. Straight into the bin; wash everything in sight – and no tomatoes. Due to a mixture of friends’ generosity and some swift ecological elbowing at a Green Fair and plant swap, I now have replacements. Seven Gardener’s Delights, one Marmande, one Alicante and two complete mysteries because the person who brought them to the plant swap didn’t bother to label them. Hey, it’s an adventure. Then there’s the weather. All my plants have come on beautifully in the last couple of weeks, and it was time to put the windbreak up around the veg patch, put it up again after it blew down the first time, put it up a third time with new stakes and more swearing, accept that ground-in dirt doesn’t come off hands easily and that all jeans have muddy knees. I was a bit late, and it had to be done. The yellow mangetout were muscling the lid off the cold frame and the beans were making a bid for freedom. The dill and flat-leaved parsley suddenly decided to behave like strange herby versions of Jack’s beanstalk and all the spuds burst out of the ground at once. The spring onions put on a couple of inch in growth overnight and the kale I’d been prevailed to take at the plant swap broke its pot. I swear I can hear the garlic growing. Everything which wasn’t already out got planted out over the weekend. 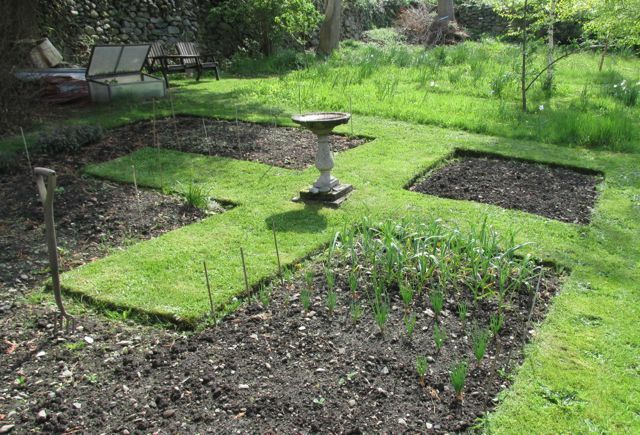 I was chuffed; the veg patch looked good. But the gardening gods were watching out for horticultural hubris. Yesterday was a day of one thunderstorm after another, as if they hadn’t made their point with the first one, and today looks set to be the same. Damn. Simply, because I’d hate myself if I didn’t, given that I have the space and (sometimes) the ability. I can grow the varieties I want and I can make economic decisions which make sense. Take, for instance, the humble onion. I can buy decent onions at a reasonable price, but decent shallots are a different matter (as, given some spectacular recent price hikes, are spring onions). So I grow them instead. I’m picky about potatoes, and my favourites are Ratte. Used to get them at Borough Market; Borough Market now 250 miles away and 12 years in the past. So I grow them. And then there are happy accidents. 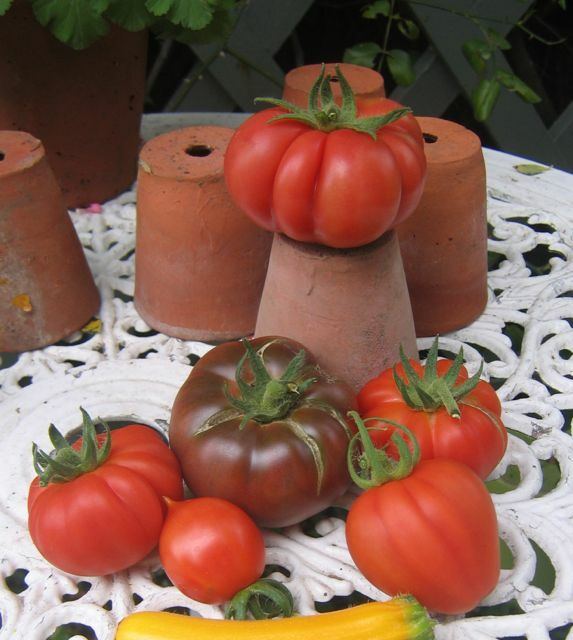 I save seed and sometimes this can produce interesting things, like the year I produced the Costoluto Russian – or possibly a Black Fiorentino – tomato. They were delicious, but further attempts at deliberately crossing Black Russians and Costoluto Fiorentinos produced nothing exciting. Or, indeed, edible. Fluff. Not good. But you never know; I could have made tomato-breeding history. These, by the way, are the parents, separated by a plant pot, and the unintended cross had all sorts of advantages. The plants were not as temperamental as the CFs and the fruit not as vine-breakingly enormous as the BRs, though I did miss the opportunity to repeat silencing the pub with a single 500g tomato, as I had the previous year. Again, you can’t recreate that experience in Tesco. But I’m missing the most obvious advantage: taste. A warm tomato, fresh off the plant, eaten on the quiet when you’re supposed to be harvesting for the pot – nothing beats it. Those baby broad beans are packed with nuttiness; the potatoes actually taste of something; the beans each have a different feel and flavour. OK, so I may be picking caterpillars off the Cavalo Nero for ages but it’s worth it to have a ribollita with real punch. And when it comes to furtive picking, you have to go a long way to beat the sneaked pea. Or several. Now all I have to do is work out how to protect an entire veg patch from the vagaries of the weather. Quite right, but I can’t get sweetcorn to grow round here. Sniff… but peas – oh yeah!